After winning the ultimate title and being the world champion, Rocky falls into a hole and finds himself picked up by a former enemy. Rocky struggles in family life after his bout with Apollo Creed, while the embarrassed champ insistently goads him to accept a challenge for a rematch. Reluctantly retired from boxing, and back from riches to rags, Rocky takes on a new protege who betrays him, as the champ's son must adjust to his family's new life after bankruptcy. Rambo mounts a one-man mission to rescue his friend Colonel Trautman from the clutches of the formidable invading Soviet forces in Afghanistan. Milo Ventimiglia ... Robert Balboa Jr.
Q: Why is Mason Dixon nicknamed "The Line"? Q: Is there anything after the credits? Q: Why is Rocky no longer running Mighty Mick's Boxing, like he was in Rocky V? "Maybe not a knockout - - - - - - - but on points, - - - I'd give it the thumbs up!" I've been able to see this before it's release date so I'll avoid giving too much away in this review. To start with when I heard that they were going to make a sixth Rocky movie you didn't have to be a die hard fan to wonder what were they thinking about, particularly 15 years after the last horrible outing! After 30 years since the original ROCKY was released one could only wonder what else they could conjure up after such a long hiatus? Yet this movie was not bad and it's important to stress that on a number of levels. This rendition of Rocky is true to the previous ones as again he is the underdog, a former champ who is encouraged to come out of obscurity and take on the current champ despite having been retired for 20 years. 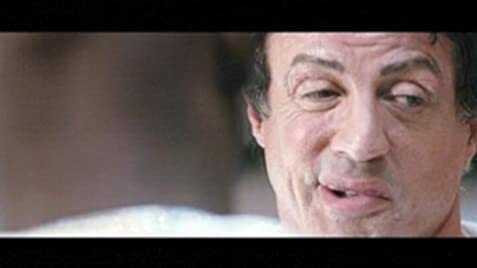 Just to recap to the earlier movies for the moment, in the original ROCKY, in some sort of bizarre publicity stunt Rocky Balboa was plucked up from a short list of "bum of the month contenders" to leap frog genuine challengers for a crack at the undisputed heavy weight title. Although he falls short, because of the effort and the show that he puts on, the public demand a rematch and consequently sequel to ROCKY is made and so on. It's important to remember that in the 1970's the American public craved for there to be white heavyweight boxing champion so when the original ROCKY was released not only was it contemporary but captured the imagination of the public at the time. Apollo Creed as the champion was obviously modeled on the brash, cocky Muhammad Ali who you either loved or hated. Also it's worth noting that in the 1970's and 80's boxing enthusiasts often wondered who would win in a fictional fight between the 1950's champion Rocky Marciano and the 1970's champ Muhammad Ali. 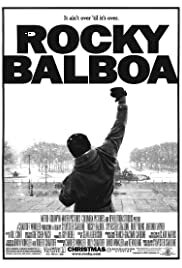 Therefore it was no coincidence the name 'Rocky'was used in the 70's, but now today in ROCKY BALBOA we are now asking who would win in 2006, Rocky from the 70's and 80's or Mason Dixon from the 2000's? The question in this movie is actually more like a Rocky Marciano v's Ali now than it was in the 70's! Another point worth mentioning is that in the original the conceited Apollo Creed was a flashy, arrogant, publicity seeking showman, but more importantly he was human. By the time of Clubber Lang and Ivan Drago in ROCKY'S III and IV respectively the Italian Stallion was up against fighters that did not seem to be human. They were void of feelings had no family and their physical prowess and abilities were so advanced that they seemed more like comic book or video game characters. In this movie Mason Dixon to a large extent returns the heavyweight champion to a more believable human role, although contemporary for 2006 i.e. athletic, brash and mean! I give credit to the writers here and to a large extent this is where the movie worked! I don't know if it was a coincidence or if it was part of the thinking but ROCKY BALBOA was fortunate enough to be released at a time when the heavyweight boxing scene itself is in a shambles and resembles a three ring circus. From blown up middleweights to an alphabet soup of nobodies in their late 30's right up to a 7 foot Neanderthal lookalike that is totally useless,--- heavyweight boxing has never been more of a joke! In a time when top athletes in their respective sports are stronger, faster or bigger and more powerful than there peers from earlier decades, heavyweight boxing is about the only sport to have regressed. The skill levels and talent are so much poorer than their counter parts in the 1970's and 80's that none of them could even carry Muhammad Ali or Larry Holmes jock strap's when they were at their best! The International powers that be have in there zeal for money have butchered the world heavy weight boxing scene so badly that its turned into a freak show. Thus the idea of a former champion 25 years past his best challenging for a world title is not as far fetched as it once might have been! This movie will have it's critics and while it is certainly not flawless I see no reason why this movie should be lambasted as it no doubt will be. At the very least it stands out from being better than 90% of the movies that are released today, many which are simply dreadful. If old 1960's,70's and 80's TV shows are revived on the big screen for the movie industries indulgence or else the public are fed an endless list of remakes why not another Rocky movie! The dialogue and writing while not great was no worse anything else I've seen recently and the production and camera angles were good. It's slow in certain areas particularly at the beginning but over all a nostalgic effort which tried to capture the theme of the earlier rocky movies. Apparently Sylvester Stallone was never happy about ROCKY V and for years the memory of it tormented him, well I think this one will have exorcised that demon ,a much better effort overall. Check it out! 224 of 301 people found this review helpful. Was this review helpful to you?